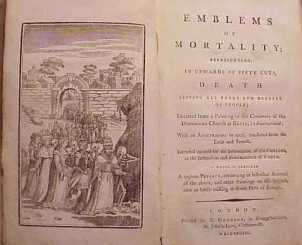 The London edition from 1789, "emblems of mortality". 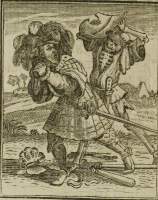 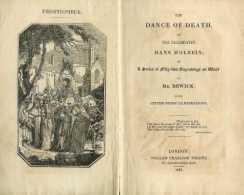 The Newcastle edition was simply named 'Dance of death'. 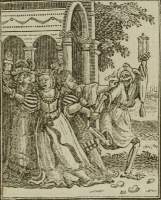 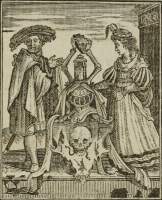 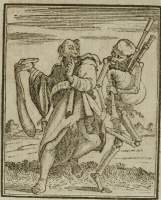 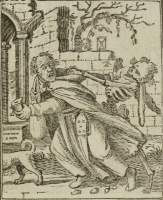 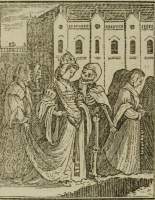 ohn Bewick's copy of Holbein's dance of death was published in 1789 in. 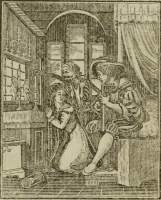 At this time, Bewick was a pupil of T. Hodgson, who published the book. 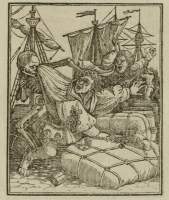 That's why it says »Printed for T. Hodgson« at the bottom of the title page. 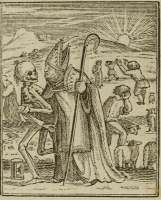 The title was most unfortunate: »Emblems of mortality; representing, in upwards of fifty cuts, death seizing all ranks and degrees of people; Imitated from a painting in the cemetery of the Dominican Church at Basil in Switzerland.«. 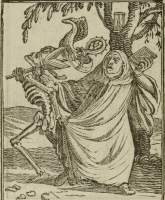 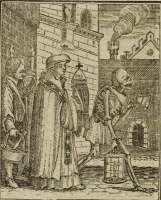 Thus Holbein's woodcuts are once more confused with the dance of death on the cemetery-wall of the Dominican church in Basel — an old myth that hails back to Georg Scharffenberg. 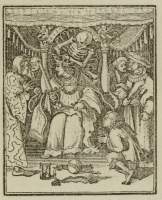 Fortunately the book contains a long and sober preface, where the author(1) after 21 pages concludes, that since Basel's dance of death was painted in 1446-48 — half a century before Holbein was born in 1498 — Holbein couldn't have been the originator. 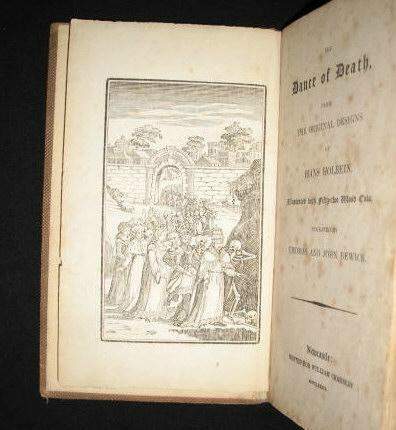 The printer reissued the book in 1795 (the year Bewick died) and in 1801, and now the title page no longer mentions Hodgson, only »Printed by Robert Bassam«. 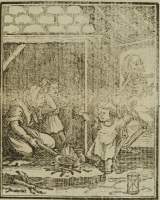 Then the wooden blocks in all probability perished in a fire in Bassam's shop in London 31 October 1803. 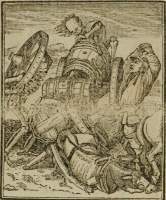 But even though the woodblocks were destroyed there was yet another re-issue. 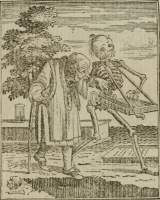 In Newcastle, William Charnley (or his son, Emerson) had bought a great number of sheets from the 1789-issue. 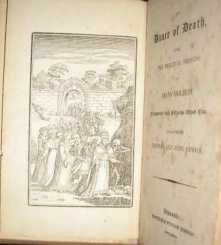 So around 1810 came another issue in Newcastle, where only the title page was new (and on different paper). 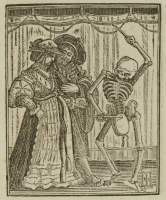 The Newcastle edition is simply named "Dance of Death", so this publisher has refrained from confusing Holbein's dance of death with Basel's dance of death. 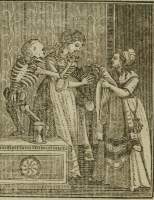 The title page says the book was printed 1789, which in its own way is true, since this was the year the sheets were printed in London. 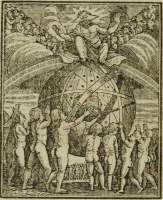 On the other hand, the publisher created more confusion by writing on the title page: »Engraved by Thomas and John Bewick«. 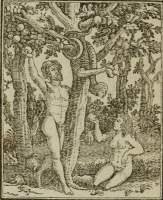 God has been removed from Eden "to avoid giving Offence". 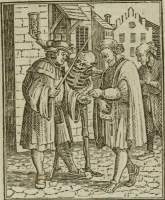 So much for the careless publishers. 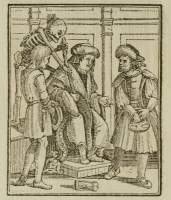 John Bewick follows Holbein's originals fairly closely. 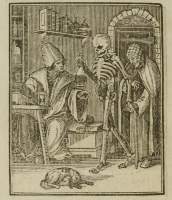 His work is skilled, but uninspired. 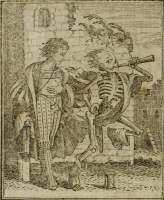 The Bewick Brothers were "white line" engravers. 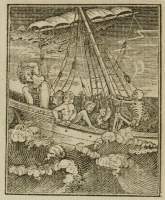 "White line" is mostly a state of mind: The old "black line" engravers would trace the motive on the woodblock and then cut away the surplus wood. 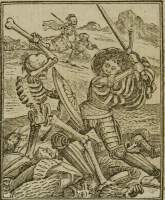 In principle the white areas were considered "junk" that must be removed to bring out the black lines. 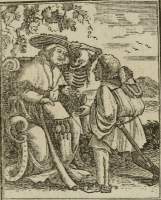 With the "white line" technique, you start with the black surface and then "let the light come in" by cutting linies in the woodblock. 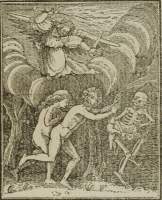 This also means that cross-hatching is avoided — like for instance the picture to the left where the wavy clouds are created using only horisontal lines. 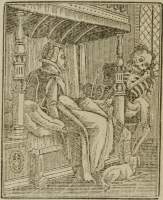 The London-preface states that the book is based on editions of Holbein's book from 1547 (where 12 pictures were added) and 1562 (where 5 more picture were added). 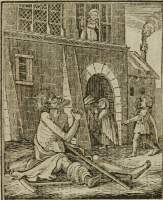 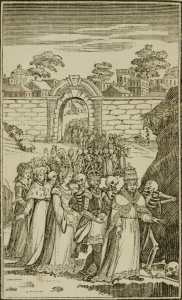 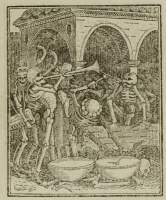 Bewick has added a frontispiece showing how Death leads the entire society into the open grave (see picture to the left). 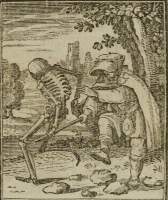 Under each picture is a small poem written in an insufferably stilted language. 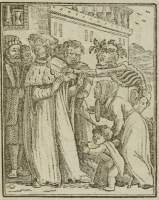 The woodcuts of the Creation with God dressed as a pope was radically changed in order not to offend (picture to the right). 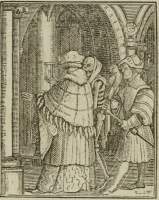 From the preface: »I have only to add, that the Cuts in the present Edition, excepting only the first (which, representing in the Original the Deity in the Habit of the Pope, to avoid giving Offence, it was thought proper to omit and to substitute in its Room one designed for the Purpose) are engraven, and the verses under them translated from the Latin Edition of 1547; and that the additional Cuts which appeared in the French Edition of 1562, […]«. 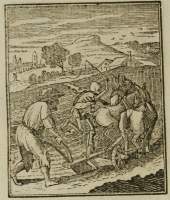 The woodblocks had perished in 1803, but Alexander Anderson copied Bewick's woodcuts for the American market in 1810 (picture to the left). 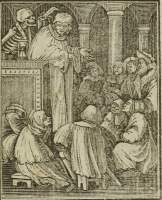 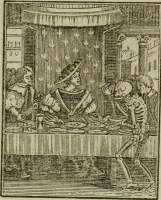 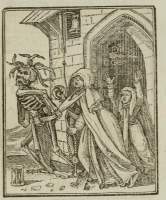 A more curious volume is one published in 1825 by William Charlton Wright, The Dance of Death of the celebrated Hans Holbein, in a Series of Fifty-two Engravings on Wood by Mr. Bewick (picture to the right). 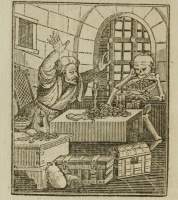 Unfortunately Wright never explained, who this "Mr. Bewick" was supposed to be. 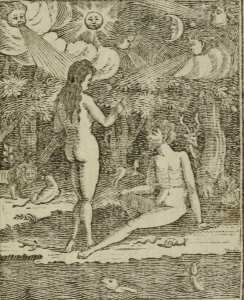 A third book that has been wrongly attributed to John Bewick is the work of an unknown Enligsh artist that was published by Tindall Wildridge. 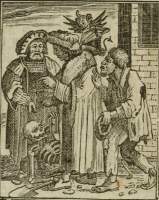 The same book as well as the 1795 edition are available from Google Books, but the quality of the scan is deplorable. 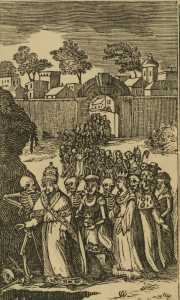 The book is also available from The Newcastle Collection. 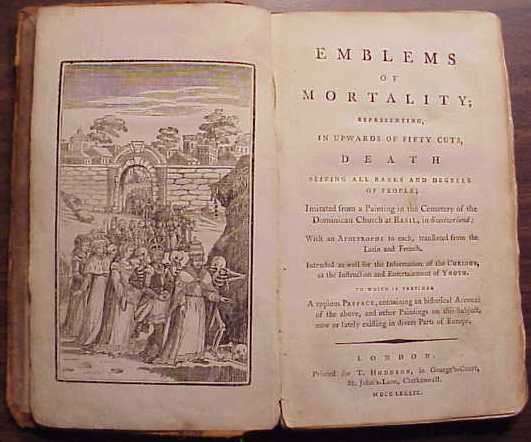 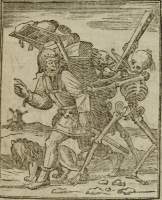 The easiest way is to go to The Bewick Collection and click "Emblems of Mortality". 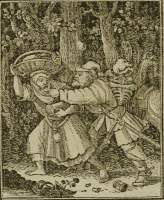 Google Books has a small booklet (only available in America) named "Holbein and John Bewick" by Wendell Garrison from 1902. 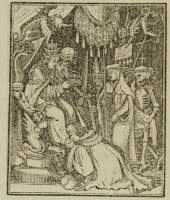 The author compares two of Bewick's woodcuts with Holbein's own cuts and Holbein's original drawings. 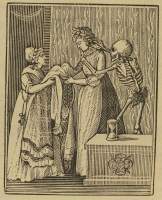 Bewick's woodcuts were copied by Anderson. 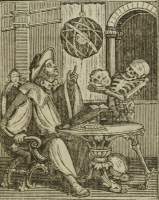 Bewick died in 1795, but his name was used for a publication in 1825. 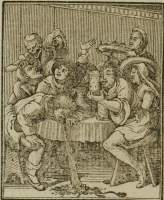 The preface is anonymous, but in the 1794 edition of Hollar's etchings, Francis Douce starts his — equally anonymous — preface by telling that one of his friends has already written an "investigation" in Bewick's book: »[…] this has already been done in a very able manner by a respected friend of the compiler of the present essay, in a little work, intitled "Emblems of Mortality," ornamented with copies in wood of the Dance of Death, by J. Bewick […]«. 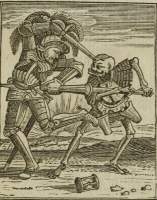 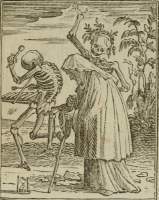 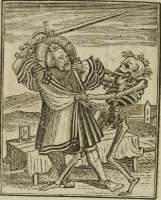 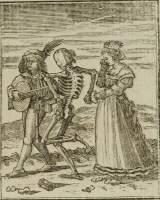 Almost forty years later in The dance of death exhibited in elegant engravings on wood (1833), Douce tells us the name: »Emblems of Mortality, […] 1789 […] With an historical essay on the subject, and translations of the Latin verses in the Imagines Mortis, by John Sidney Hawkins, esq. 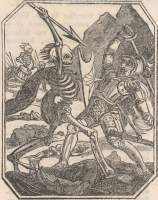 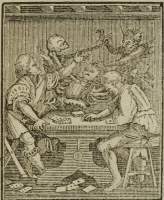 The cuts were engraved by the brother of the celebrated Bewick« (page 118-119). 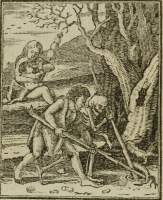 Quoted from Thomas Bewick: his life and times by Robert Robinson, 1887, page 90.